If you are having issues with creating or restoring a Winclone image, here are the steps to view and send the Winclone log to resolve the issue. In order to get more information during imaging and restoration, you should turn on verbose logging. 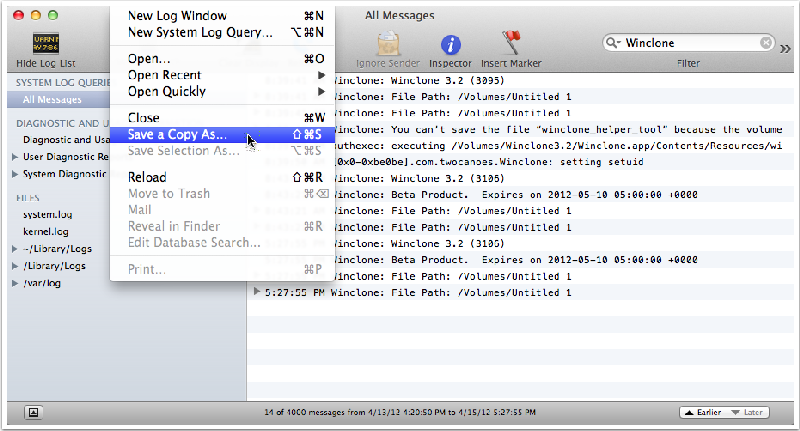 Select Preferences from the Winclone menu, and check the box next to Verbose Logging. 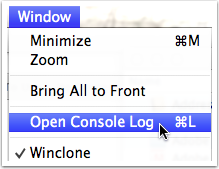 After you have turned on verbose logging and are seeing the issue, select Open Console Log from the Window menu. 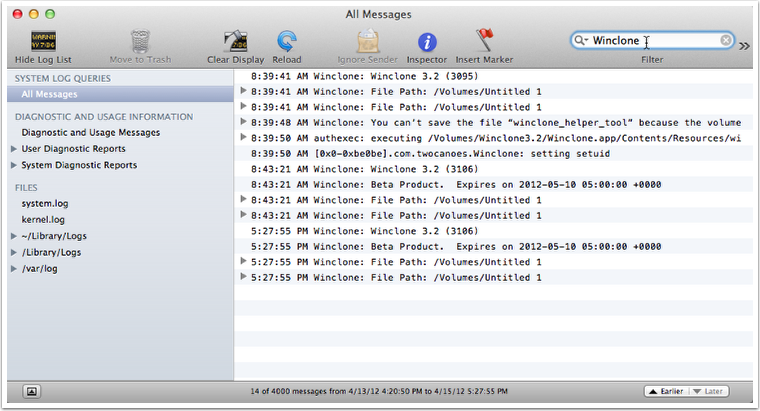 This will show all the system messages, including information about Winclone. You can filter just the Winclone logs by searching on the word Winclone. Makes sure that you have All Messages selected (it is selected by default). In order to send a copy of the log, you must save a copy of the log and then compress it. From the File menu, select Save A Copy As.... 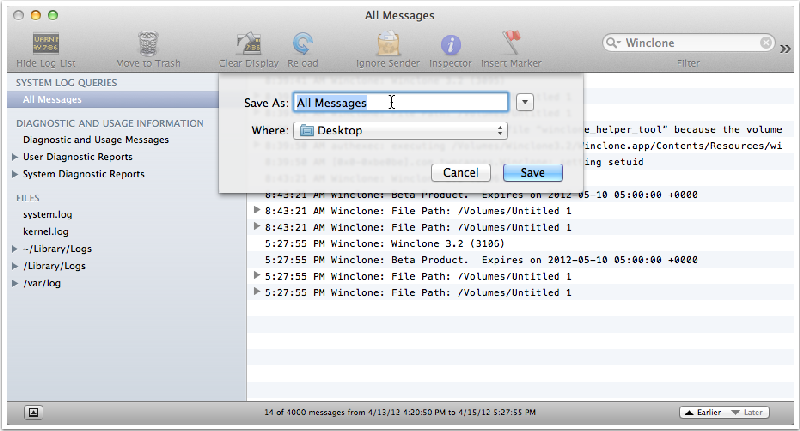 Note that this will save all the messages in the log, not just the Winclone messages. When prompted, save the log to your desktop. 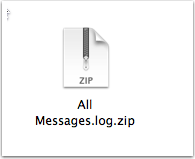 Since the log can be quite large, it should be compressed prior to sending. 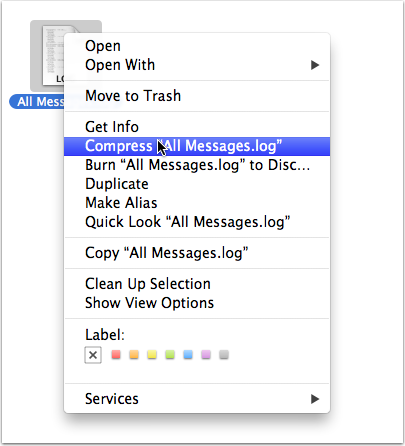 Control-click on the log that you saved on your desktop, and select Compress "All Messages.log". You can now email this compressed log (with the extension .log.zip) to support@twocanoes.com along with a description of your issue. Article published: April 20, 2017 22:27 . Article last updated: April 20, 2017 22:27 .